Immerse yourself in a mix of sweet and sour delight of Avarya's Garlic Mango Chutney. The combination of spicy garlic and sweet mango provides you with a lip-smacking side dish to accompany every meal. With the exquisite taste of mango, Avarya brings you an ideal partner to lighten up boring meals. 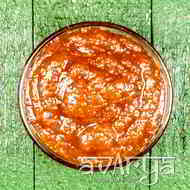 Garlic Mango Chutney	AC-CN-1111 Immerse yourself in a mix of sweet and sour delight of Avarya's Garlic Mango Chutney. The combination of spicy garlic and sweet mango provides you with a lip-smacking side dish to accompany every meal. With the exquisite taste of mango, Avarya brings you an ideal partner to lighten up boring meals. The shelf life of Garlic Mango Chutney is 180 days.